The grocery service I use occasionally surprises us by adding a free thank you gift to my usual order. These little gifts range a sample of a new product to a sweet treat from their bakery. It's always a welcome surprise, and--more often than not--I find that the new product is actually so good that it ends up in regular rotation on our future grocery orders. A couple years ago, they added a bottle of Zico chocolate coconut water to my order. I tried it, and was instantly smitten. The drink was refreshing with tons of great chocolate flavor, but then I flipped the bottle around to check out the ingredients, and was disappointed to find the addition of sugar as well as other additives. I tweeted a message to the company, expressing my disappointment that they would add sugar to something like coconut water that is already naturally sweet, but they said it wasn't very much and still much less sugar than one would find in store-bought chocolate milk. True, yes, but I would never purchase or drink chocolate milk so it was a moot point. I never purchased that brand again, and soon moved on to preferring 100% raw coconut water brands like Harmless Harvest and Copra, which are about as close to coconut water that is fresh out of a coconut as you can get. And then a few days ago, I had an idea! While sipping from a bottle of coconut water, my eyes laid on an open container of cocoa powder leftover from an earlier baking project. I added some to my water, shook, and took a taste. Chocolatey coconut water with the perfect level of sweetness and zero added sugar or other additives. A tiny pinch of sea salt added a bit more balance, and suddenly I knew I had something amazing on my hands. It's become a new favorite around here, and so I figured I'd share. It's so simple, but so good, and wonderful when you're craving something chocolate. Even though coconut water is pretty high in natural sugars (about 21g in my 11oz bottle), those sugars are mostly glucose, which is metabolically easier on your system. With the addition of a few teaspoons of antioxidant-packed natural cocoa, it's a refreshing, healthy treat you can feel good about drinking. Makes 1 serving. Multiply as desired. 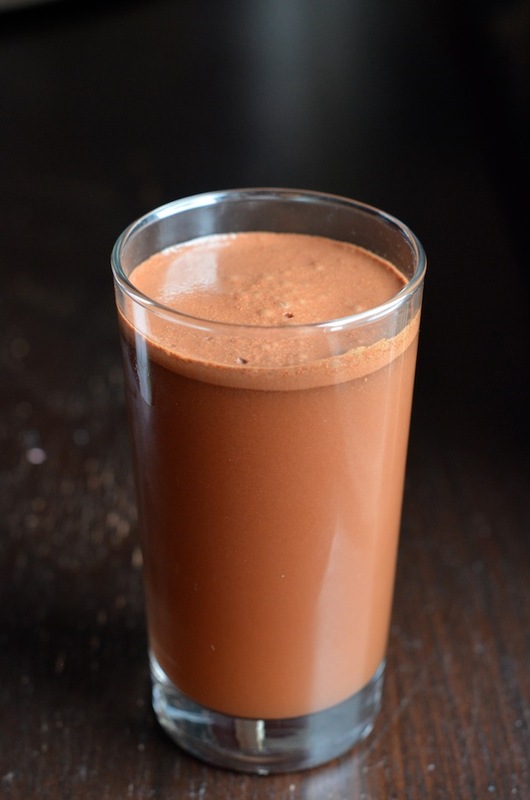 Combine coconut water, cocoa, and salt in a small bottle or jar. 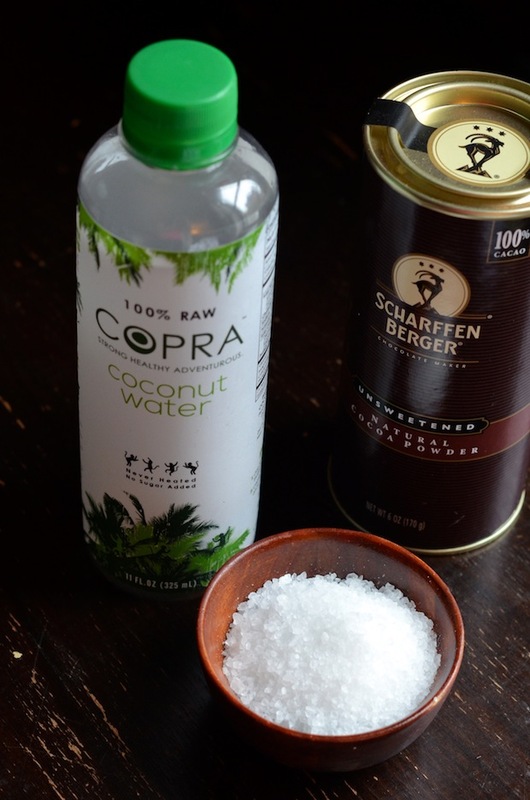 (You can add the cocoa and salt to the coconut water bottle, if you'd like.) Cover and shake vigorously. Best enjoyed within 24 hours. NOTE: I found that the bottles of Copra coconut water come in 11oz bottles; if you use that size, just increase the cocoa to a full 2 teaspoons.